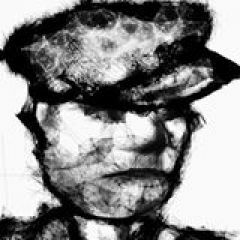 The massacre is the most censored event on the Chinese internet. A viral image circulated on Weibo five years ago. via Reddit. 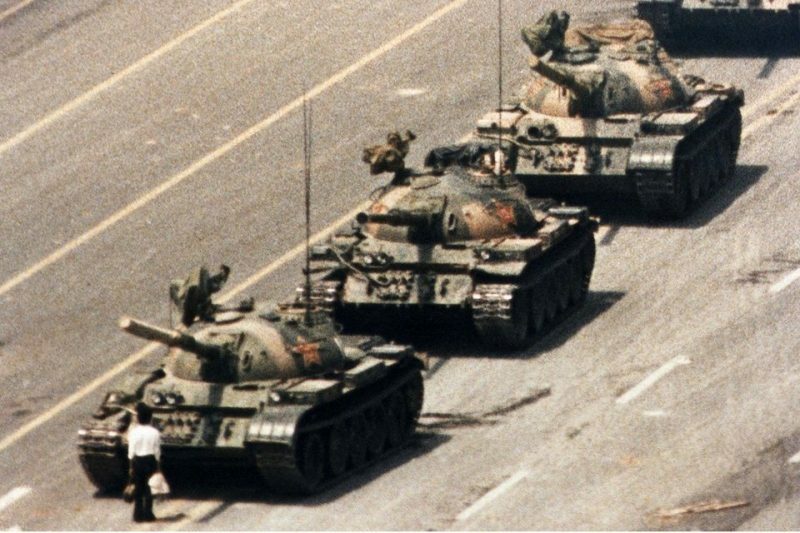 It has been 30 years since the rise and fall of the 89 Democracy Movement (八九民运) in China, that culminated with the infamous Tiananmen Square Massacre on June 4, 1989. On that day, the Chinese military carried out a brutal crackdown on student-led demonstrations calling for democratic reforms. The Chinese Red Cross estimated that 2,700 civilians were killed, but other sources point to a much higher toll. A confidential US government document, revealed in 2014, reported that a Chinese internal assessment estimated that at least 10,454 civilians were killed. The Communist Party of China has never publicly acknowledged these events or accounted for its actions with an independent investigation. There are no references to the 89 Democracy Movement in any history textbooks and most university students in China have never heard about the massacre. Since the early days of the Internet in China, the movement and the massacre have been taboo topics for online discussion. And each year around the anniversary of the massacre, social media platforms and outspoken groups and individuals face heightened pressure to silence narratives about the movement. 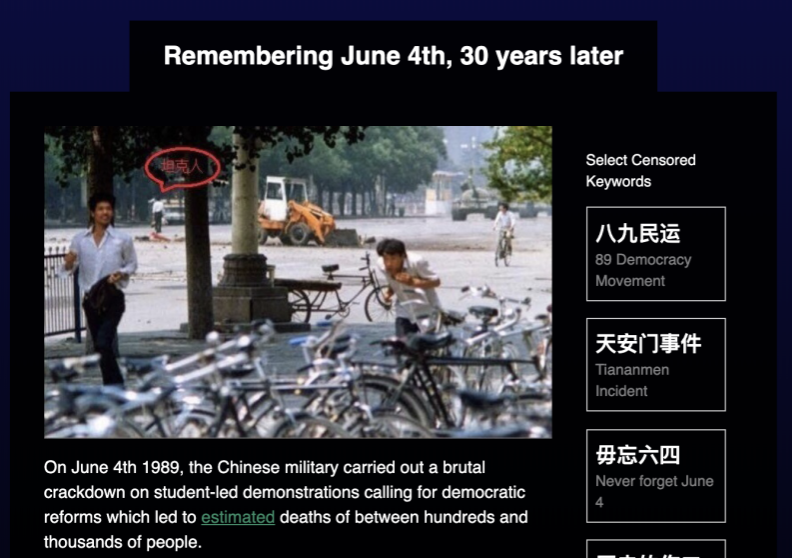 To mark the 30th anniversary of the Tiananmen Square massacre, our teams at the University of Hong Kong's Weiboscope and the University of Toronto's Citizen Lab developed a compendium of content that has been censored on social media in China due to its connection with the 89 Democracy Movement. With this work, we tell some of the forbidden stories of the largest democracy movement since the establishment of the People’s Republic of China. China’s approach to controlling information and speech on social media relies on a system of “self-discipline” in which companies are responsible for keeping prohibited content off of their platforms. 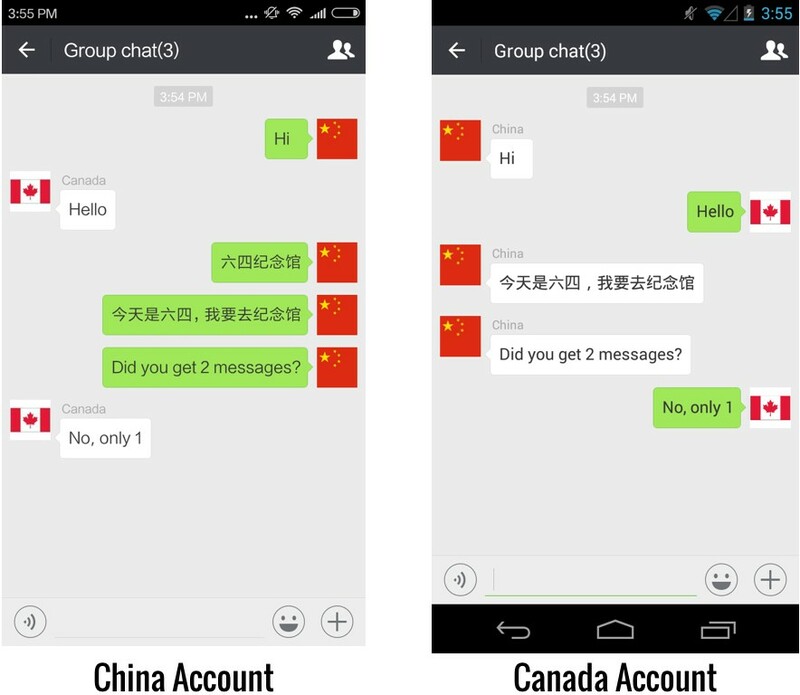 Social media platforms like WeChat (the most popular chat app in China) and Weibo (China's Twitter-like platform) are expected to invest in technology and personnel to carry out content censorship according to government regulations that prohibit vaguely defined topics including online “rumors”, information that damages “national honor”, “disturbs economic or social order” or is aimed at “overthrowing the socialist system”. Failure to comply with regulations can lead to fines or revocation of operating licenses. Weiboscope and Citizen Lab have studied how the self-discipline system works on microblogs, chat apps, live streaming platforms, and online games developed by a range of companies. Across these platforms, June 4 is one of the most consistently censored topics. 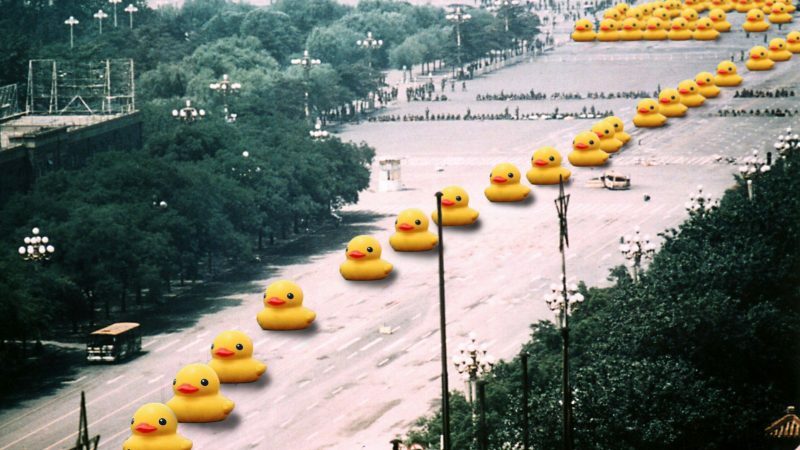 While they know their posts will be swiftly censored, Chinese netizens still routinely commemorate the 1989 Tiananmen Square Massacre on social media each June. These users take a variety of creative and subtle approaches in this ritual. Coded words, memes, comics, derivative works, literature and photographs are used to reference June 4. Many users post emojis of lit candles to commemorate the crackdown. For them, the Tiananmen crackdown is not just a historical or incidental tragedy. It represents a life-long struggle to tell public history. 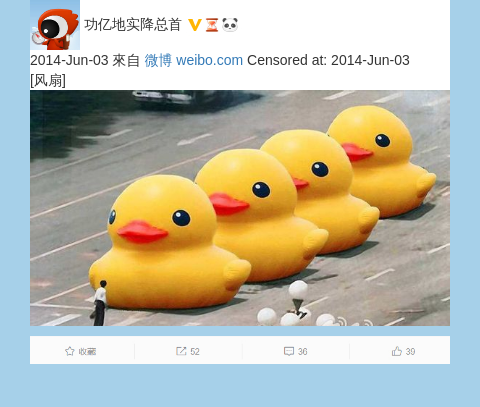 Drawing from our dataset of Weibo posts related to June 4, that were censored between 2012 and 2018, the Weiboscope team identified 1256 censored posts. Many of those were removed within 30 minutes of being published. For the past ten years, Citizen Lab has been studying social media censorship in China and collected keyword lists that trigger censorship from a range of applications. June 4 is a consistently censored topic on all of the applications we have studied. To date, we have compiled a list of 3,237 keywords that appear to be related to June 4. Together Weiboscope and Citizen Lab reviewed our June 4 related keywords and images to identify narratives and themes. We will explain our methods below. News photo taken in 1989 Beijing by Jeff Widener of the Associated. 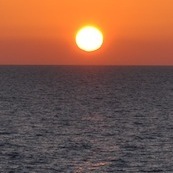 Fair Use. According to Weiboscope data, the infamous Associated Press photo “Tank Man”, originally shot by Jeff Widener, is the most commonly referenced photo in online commemoration efforts. In our research, we found dozens of images that make subtle or playful references to Tank Man. One can find remixed versions of the image showing a lone man confronting a line of cigarette boxes, yellow duck toys, books, logos, computer mouses, or even just an empty street in Beijing. The crackdown on Internet freedom in early June has become an iconic source of panic for the Communist Party of China. The Weiboscope dataset has brought to the surface posts censored for including seemingly benign keywords like “today (今天)”, “yesterday (昨天)”, and “tomorrow (明天)”. Censored keywords from the Citizen Lab dataset present a range of topics including references to historical milestones in the 89 democracy movement (绝食请愿, “hunger strike” a reference to hunger strikes staged by students during the protest to gain the attention of authorities), politicians (八九邓小平 “89 Deng Xiaoping”, the paramount leader of China during the movement) and student leaders (民运领袖王丹 “Democracy movement leader Wang Dan”, a prominent leader of the 89 democracy movement). The keywords also show creative ways to refer to June 4 like numerals (“89VIIV”), homonyms (陆4, “Land 4,” the character ‘’陆 Lù’’ sounds similar to six ‘’六 Liù’’ in Chinese), and coded references (儿童节过后三天, “three days after Children’s Day”, Children’s Day in China is celebrated on June 1, three days prior to June 4) . 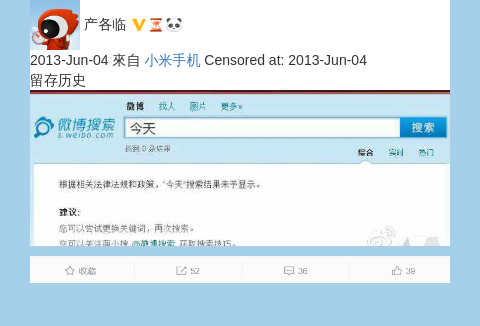 In symbolic acts of protest, a significant number of Weibo users have posted screenshots of system warnings, showing their failed attempts to post or even search for these three keywords. These types of posts also serve as a barometer for public sentiment towards the present regime. Censored keywords across platforms also reference memorials of the event such as the annual commemoration held in Victoria Park in Hong Kong, which features a candlelight vigil (维园烛光, “Victoria Park Candle”). How did we collect these censored keywords and images? Citizen Lab and Weiboscope have used a variety of methods to understand how Chinese social media platforms censor content. Platforms in China generally use a mix of automated filtering, performed by machines, and manual removals, performed by humans. 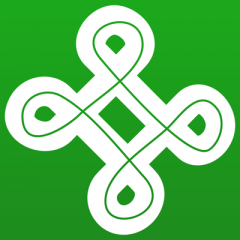 Some platforms conduct filtering on their own servers, while others have censorship rules built into the application running on your device. Sina Weibo and WeChat both use the first approach (known as “server-side” censorship), which makes it very difficult to see what's happening on the inside. 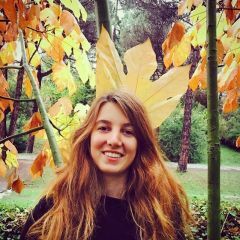 But with companies that filter content within a user's application (known as “client-side” censorship), there are ways for researchers to examine the process, as all of the rules to perform censorship are inside of the application running on your device. Often these applications have built-in lists of keywords. When you type a message or post, the application checks your message. If you have used one of the keywords, then the message is not sent. 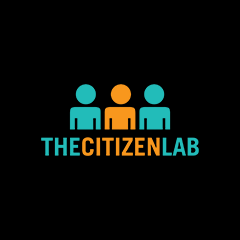 Through reverse engineering, Citizen Lab has collected complete keyword lists for chat apps, live streaming platforms, and mobile games. 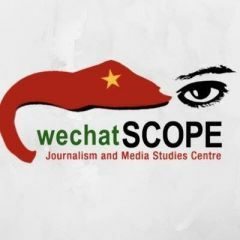 As of the first quarter of 2019, Weiboscope had collected over 810 million Weibo posts, of which more than 700,000 are confirmed to have been censored after publication. In the lead up to the 30th anniversary of June 4, Weiboscope and Citizen Lab will release Censored Histories: June 4, a series of posts that feature images and keywords that have been blocked on social media in China. The first post marks the April 15 1989 passing of Hu Yaobang, a former general secretary of the Communist Party of China who helped navigate China away from orthodox Marxism. His death was a catalyst for demonstrations that marked the beginning of the 1989 Tiananmen Square protests. Stay tuned for more stories on the 89 Democracy Movement as June 4 approaches. 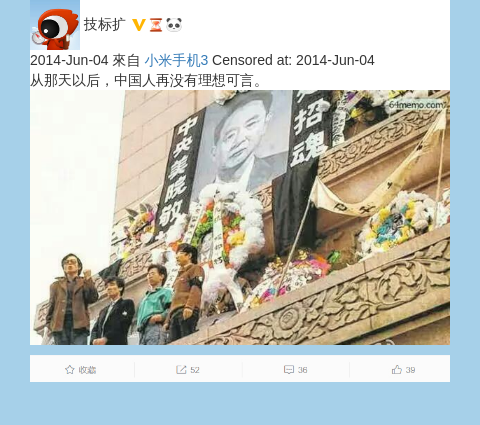 VISIT Weiboscope's archive of censored June 4-related Weibo posts on the project website and Instagram. VISIT Citizen Lab's archive of blacklisted June 4-related keywords on GitHub.